Jim Nance played for the Patriots for seven seasons, appearing in 94 games from 1965-71. His 45 rushing touchdowns are a franchise record, while his 5,323 rushing yards place second in team history. 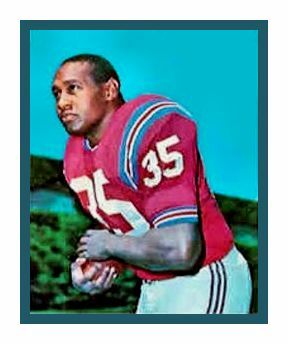 He was the American Football League's Most Valuable Player in 1966, leading the league with 1,458 rushing yards - the highest single-season total in the AFL's 10-year history and a mark that stood as a Patriots record for 20 years. Nance was the AFL's leading rusher again in 1967, totaling 1,216 yards. When his career came to an end in the NFL, he had 1341 carries for 5401 yards and 45 rushing touchdowns. He was also a devastating blocker and added 133 catches for another 870 yards and a touchdown. Nance was born on December 30, 1942 in Indiana, Pennsylvania. He starred at Syracuse University as a football player and an All American wrestler. Nance tied the school record for career touchdowns (13) and led the Orange (then the Orangemen) in rushing in 1964, scoring in ten straight games. He was two time NCAA heavyweight wrestling champ and lost only one match in 92 in three varsity wrestling seasons. 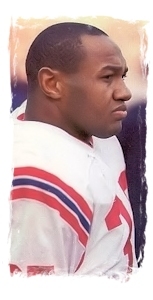 Nance was drafted in both the AFL Patriots in the 19th round with the 6th pick of the 1965 AFL Draft, and selected by the Chicago Bears of the NFL in the fourth round of the NFL Draft. He chose to play with the Patriots. The 1967 season was more of the same for Nance, with one caveat. The Patriots’ opponents realized if they could stop Nance, the Patriots were unable to score. As a result, more and more teams started stacking the line of scrimmage with eight or nine guys in the box. He finished the season with a flurry, gaining 164 yards in 24 carries against Miami. He ran for 1216 yards, averaged 4.5 yards per carry and scored seven touchdowns on his way to his second AFL All-Star Game. In 1969 he won league's Comeback of the Year Award as runner-up for league's rushing crown. This strong performance followed ankle surgery after injury-plagued 1968 campaign.